In the early 19th century these 10 acres were part of Burgundy Plantation. In the 1850s, John A. Fairfax established a 150 acre plantation named Fairview on the property. He improved the existing dwelling originally constructed between 1800 and 1830. The property changed hands several times until 1847 when Bushrod Frobel purchased the land. Within a year Frobel sold the property and in 1854 it was sold to Fairfax. In 1921, the Sisters of the Holy Cross, from St. Mary's Academy in Alexandria purchased the property. Since 1936, it has been a site of a private residence. During the Civil War, Union officers occupied the house and troops camped on the grounds which were adjacent to Fort Lyons. Fort Lyons was one of the Union forts erected in defense of Washington City. the surrounding area all day, but didn't find the Gray Ghost. Monday January 26, 1863: We were at Mrs. Fairfax's this evening and learned how narrowly she escaped being killed on Thursday last, she had just finished dressing and had left her room, when a ball came tearing through the walls and into her room, shivering the looking glass frame and splintering her bed stand and then dropped near the fireplace where two or three of her little children were standing. She says if she had been in bed she would have been killed. Mrs. Fairfax went out and searched all about, and through the bushes but could see no one. Location. 38° 47.768′ N, 77° 5.277′ W. Marker is near Alexandria, Virginia, in Fairfax County. Marker is on Tennessee Drive east of Palin Place, on the left when traveling east. Touch for map. Marker is at or near this postal address: 3398 Tennessee Drive, Alexandria VA 22303, United States of America. Touch for directions. Other nearby markers. At least 8 other markers are within 2 miles of this marker, measured as the crow flies. Fort Lyon (approx. 0.7 miles away); Lake Cook (approx. ¾ mile away); Parapet and Gun Platforms (approx. 0.9 miles away); The Cameron Valley (approx. one mile away); Fort Williams (approx. 1.1 miles away); Defenses of Washington (approx. 1.2 miles away); Fort Ellsworth (approx. 1.2 miles away); Birthplace of Fitzhugh Lee (approx. 1.4 miles away). Touch for a list and map of all markers in Alexandria. More. 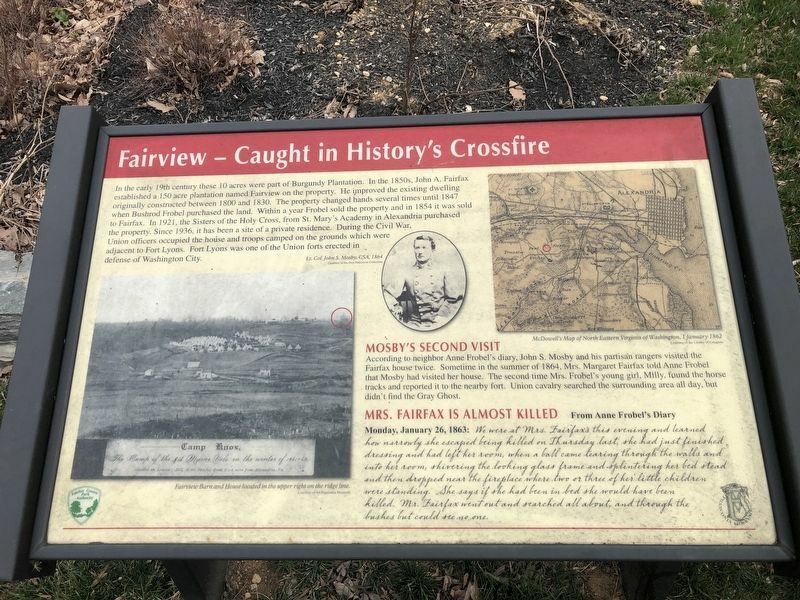 Search the internet for Fairview – Caught in History's Crossfire. Credits. This page was last revised on March 29, 2019. This page originally submitted on March 29, 2019, by Devry Becker Jones of Washington, District of Columbia. This page has been viewed 49 times since then. 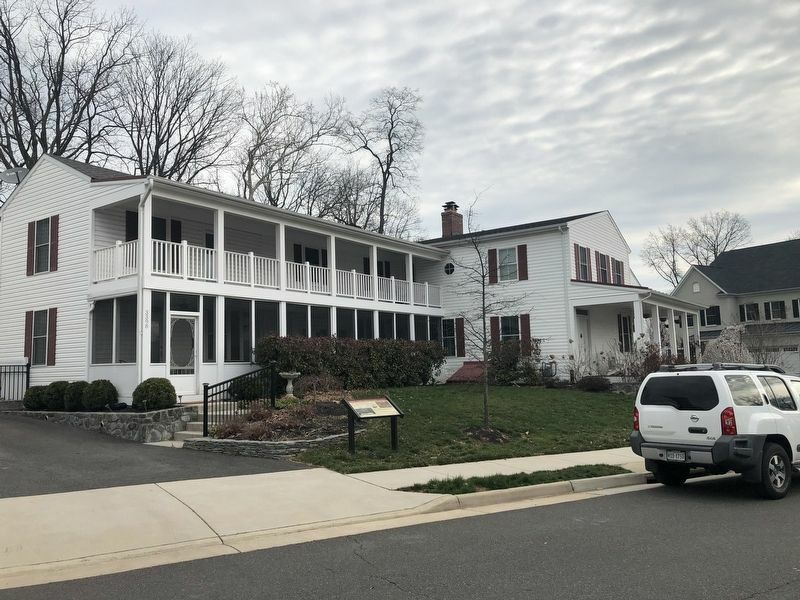 Photos: 1, 2. submitted on March 29, 2019, by Devry Becker Jones of Washington, District of Columbia.